A short while ago I posted a thread about my new interest in Scandinavian styled bushcraft knives, specifically the knife that originated with Mors Kohanski's description of the perfect bush knife in his book on bushcraft then made famous by knife maker Rod Garcia in the form of his Skookum Bush Tool. Ever since the SBT hit the market it's been in high demand, I put in an e-mail to Garcia, it took about a month to get a reply, he operates a one man shop and is a very busy guy, as of a month or so ago his order list is long and the waiting time for a new SBT is close to four years from deposit to shipping the order, at my age I could be "finished" before the knife. The other option if I want an original SBT is to buy one on the secondary market, the problem with that is that even a well used SBT when you can find one will sell for at least twice the cost of a new one, often in the $500.00~$700.00 price range, which is out of the question financially for me. The next best option is to try to find a SBT clone, which for me is the more practical way around the problem, the least expensive example of the blade shape is the Condor Woodlaw, I did manage to find one that started out as a finished blank that someone bought and handled in micarta with white and neon green spacers and with a matching ferro rod, I like the size, looks and feel of the knife, but it's not a serious contender. I then bought an American knife Co. forest knife made by Bark River, that one is a very nice knife, has the SS pommel plate, beautiful Curly Maple scales, and the fit and finish rivals any custom made knife, but the front of the handle is tapered and it is scary sharp, the fear of my hand slipping onto the blade is too great so it's gone. As I write this post I'm waiting for the mail delivery to bring me what I'm hoping will be the next best thing to an original SBT, it's as close to a SBT as you can get, it's custom made by Black Feather Knives in another one man shop in Virginia, 01 tool steel, 4-1/4" blade, 4-1/4" handle of dark Ironwood, brass and steel pins, brass lanyard hole, and a mosaic pin in the center of the scales, plus a welded SS pommel plate, like the SBT the handle is coke bottled shape with a good flare where the handle meets the blade. I'll have more to say after it gets unboxed, later. I want a photo Moe. What is the name of the Blackfeather model you bought? The bushtool without the welded pommel or the welded pommel version? Sounds cool Moe! I always thought Red's version of the bush tool was a good one too. I really like the looks of the SBT but have never seen one - or a good clone - in person. I profiled one a while back but never finished it. I'd really like to see pics when you get yours. the two bushcraft knives that I feel work best for me, are both by Mark Hill in the UK. He posts here as Hillbill. The smaller Eagle was with 01 steel, the larger Crocodile was made with RWL34 steel. Both can do any task you assign, and do that well. Bullet proof. The unique blade shape and handle angle make wood work a breeze. I have a Red clone and it is one of my favorites. I wouldn't trade it for a SBT. Better than a photo Stan, I was going to post a link to a video review of the knife made by Mike Barton in 2015 when the model was first introduced, but Mannlicher beat me to it, so just click on his link and you'll see the knife up close and see it in action. When I said "the knife" that's what I meant, I saw that video a little over a year ago and fell in love with that knife and lusted after it ever since, of course I knew there was very little chance of my ever owning it, the knife in the video is a one off knife made especially for Mike Barton in exchange for his making the promo video review of Black Feather Knives and of the then new Bush Tool model knife. Since the Shot show the BF Bush Tool has been on back order, and the price has jumped to $300.00 for the base model with the steel pommel plate and Micarta scales, adding ironwood scales, a mosaic pin and red liners would have driven the cost up quite a bit more than I can afford on a retirement income. But, a man can still dream, and dreams do come true on rare occasions when you least expect them, about a week ago while scrolling through the classified section on another knife forum, I see the same knife I've been drooling over for sale by a member I've known and respected for several years, I contacted him, we made a deal on a trade and that exact knife is now sitting right next to my computer as I type this post. The knife and Sheath has been used but doesn't show any wear and is in almost new condition, it fits my hand like it was made just for me, I received it late afternoon yesterday in the mail and have been fondling it off and on ever since, now if this blasted rain can ever stop I'll be able to get out and give it a test drive. Thanks posting that video Mannlicher, I was going to post it but you beat me to it. Thanks Moe. I am waiting for a super neat knife now but I always like to read about other knives that people like. The knife you're waiting for wouldn't be a Sarge Kephart clone would it ? it's a nice knife butwhat is the thickness of the blade? cause i would like to make a few. in 01 steel. so if someone could answer that i can order some steel. Hayshaker, this says 1/8" thick ... I always thought they were thicker. Workmanship looks to be very good. Looks are not deceiving. Plunge lines are even, flats have a flawless satin finish, edge came extremely sharp. Probably the best handle work I have ever seen too - there isn't a rough spot anywhere. 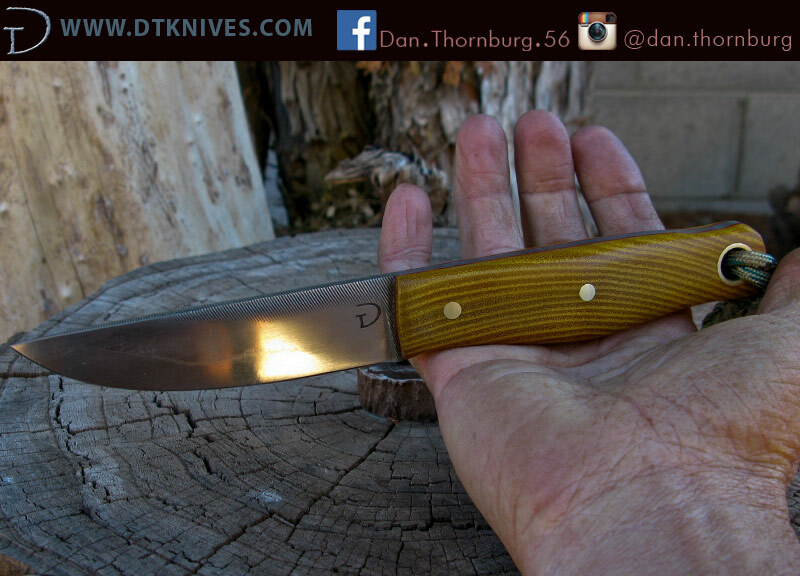 Pins and lanyard tube are perfectly even with the micarta, all the edges have been smoothed over and the scales themselves are completely flush with the tang. And I do mean completely; even using a fingernail you can't tell where the micarta stops and the tang begins. That's a first for me. I actually went to Joe's house when I commissioned the knife (bring a 4 wheel drive truck if you do the same. trust me ). Looking at the shed where he makes knives I was thinking "hmmm, wonder if this is a good idea". Then I saw some of his knives and said "yup, this could work". For me it sure did. The only area I'm not thrilled with is the leather sheath. It's nice enough, but it's not wet-formed and the retention isn't all that great. He farms out sheath work to a local guy though, so that's not on Joe directly. I had a jack-of-all-trades design in my head for a while, essentially a mash-up from several other styles that had at least one aspect I've found to be useful over the years. BHK has a 'design your own knife' service, so I tried them first. Bad idea; that was an 11 month journey into hell. Their ineptitude was astonishing. It was like working with a cable company. Yea, that bad. One day I'm watching a video on Joe Mobley's channel (Feral Woodcrafter) and he's reviewing a knife that Blackfeather had made specifically for him, and it's the same design I had in my head! Turns out Blackfeather Knives is about 2 hours from my brothers house in VA, and I was heading down that way for a visit a few weeks after I saw the video (I'm in NJ). Time for a little road trip. I had Joe Hunnicutt (Blackfeather Knives) alter a few aspects of Joe Mobley's knife - among them, stretch the blade an inch - but Mobley's knife was so close to what I had down on paper that we used his as the starting point and adjusted from there. What method(s) & tool(s) do you use to sharpen it? Haven't needed to sharpened it yet, but for touch-up I've just used a ceramic rod and leather strop. Recurves are not the easiest things to sharpen though. I've been a knife fanatic for decades, and in that time I've gotten pretty good with free-hand sharpening, so for me at least it's not really an issue. I've sharpened a couple of knives in my day too, but that thing looks like it would be a giant P.I.T.A. to re-sharpen to me.....especially, if you had to repair a place that got significantly damaged by some unforeseen circumstance. In one of his multi-post mega-reviews a while back, Moe did a great job of ALMOST convincing me to buy one of those electrically-powered WorkSharp knife sharpeners. If I had one of THESE recurved beasts to sharpen, you can bet your bottom dollar that my check for a WorkSharp would already be in the mail! What does your Black Feather knife have for an edge grind ? Also, like you, I find that I don't have to sharpen my knives very often if I use a ceramic stone or smooth steel on them after every outing followed up by a good stropping on a loaded leather strop, I have a few knives that I bought a couple of years ago or so that I've used often that I've never sharpened, just care and a good stropping brings the edge right back, of course knife quality means allot. I don't know what Joe uses regularly, but my particular knife is Scandi with a secondary bevel. I like the blade shape and the handle profile looks really good. Moe are you ready to move this to a new home yet? Afraid not Spyder, it's going to be a keeper, at least for the foreseeable future, I have sold a few knives this season including my Turley MO. River, and I'm thinking of selling a few of my MLL knives that I don't use, on the flip side I did pick up a new #2 model Puukoo from Terry Stilwell, a new Dave Beck Boundary Waters knife, and have an Adventure Sworn Mountaineer coming in at the end of this coming week. The Stilwell and Dave Beck came in after I got the Black Feather Bush Tool and I haven't been tempted to get them dirty, I'm going to keep the Stilwell and Adventure sworn for now but may put the Beck up for sale, I've had the Black feather Bush Tool for about four months now, it and my Adventure Sworn Voyager have been my go to blades for the whole summer season and I really don't see that changing anytime soon. I'm really surprised that Joe's knives haven't been talked up more than they have, I've only seen three of them up for sale, mine, and the one that SwampYankee64 picked up a couple of weeks ago, and one other new one for sale on the other Bushcraft forum, Black Feather does have a waiting list and I read on the Blade Forum that he's under contract for a state forestry service out west (it may be Utah) to make a good sized run of Bush Tools for them. I'd say if someone is in the market for a high quality hand made general purpose outdoor knife at an affordable price they can't go wrong with a Black Feather or Adventure Sworn knife if they can find one.